The SLA5800 Series Mass Flow Controllers are now offered with EtherNet/IP™ digital communications interface. The units are suitable for applications such as life science, chemical/petrochemical research, laboratory, analytical, fuel cell, thin film and other segments. The web-based interface allows network settings for configuring controllers. The units offer improved zero-drift specification with its configurable multi-gas/multi-range capabilities. 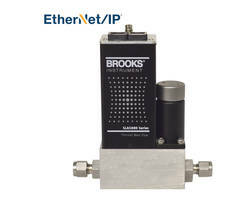 HATFIELD, Pa. (January 21, 2019) – Brooks Instrument, a world leader in advanced flow, pressure, vacuum and vapor delivery solutions, has added the EtherNet/IP™ digital communications interface to its industry-leading SLA5800 Series mass flow controller (MFC) family of products. Ideal for applications in life science, chemical/petrochemical research, laboratory, analytical, fuel cell, thin film and other segments, the SLA5800 Series features high accuracy, industry-leading zero stability and high repeatability. Available with advanced, configurable multi-gas/multi-range capabilities, the SLA5800 Series offers a better zero-drift specification compared to competitive products and is proven to maintain factory calibration and accuracy longer. Integrating the high-speed digital EtherNet/IP interface to the SLA5800 Series MFC platform increases the controller’s functionality by making it easier for OEMs and end users to leverage real-time, rich process data with high-speed digital communications. Newly expanded and patent-pending advanced diagnostic and alarm capabilities which provide pedigree, performance and reliability data from the MFC. This enables predictive and preventive maintenance to help improve overall equipment effectiveness, reliability and flexibility. Web-based interface which allows network settings to be easily configured on the MFC. OEMs can provide value-added process management and control capabilities, giving users real-time information to improve operating results. Compatibility with Rockwell Automation® DCS software through an enhanced device profile enabled in the SLA5800 EDS file that unlocks advanced features in Rockwell Automation Studio 5000® software. This helps facilitate setup and integration of the MFC into the DCS/PLC. For information and resources about the newly enhanced SLA5800 Series MFC, visit https://experience.brooksinstrument.com/EtherNetIP. Since 1946, Brooks Instrument has been a leader in precision fluid measurement and control technology. Providing instrumentation for flow, pressure and vaporization, the company serves customers in pharmaceutical and biopharmaceuticals, semiconductor manufacturing, fiber optic and thin film manufacturing, solar cell, LED, alternative energy, oil and gas refining and chemical and petrochemical research. Flow Sharing Control increases hydraulic system dynamics. Pulsation Dampener supports AODD pump applications. Thermal Mass Flow Controllers offer sub 1 sec settling times.